Greetings, friends! 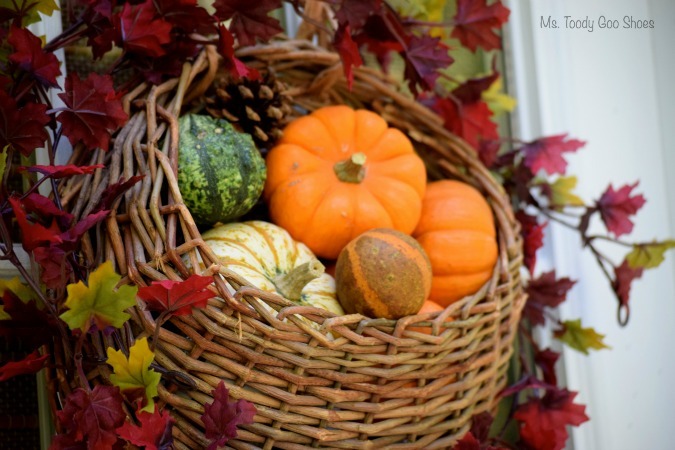 I’m Amy, from Ms. Toody Goo Shoes, and I’m happy to be back here at A Little Claireification for my November Home and Garden post. I’m still wrapping my arms around the November” part. How did we get here so fast? It seems like just last week that we were making s’mores, and shaking the sand out of our shoes. We’re just past the peak foliage here in NJ, and fall is definitely on the wane. 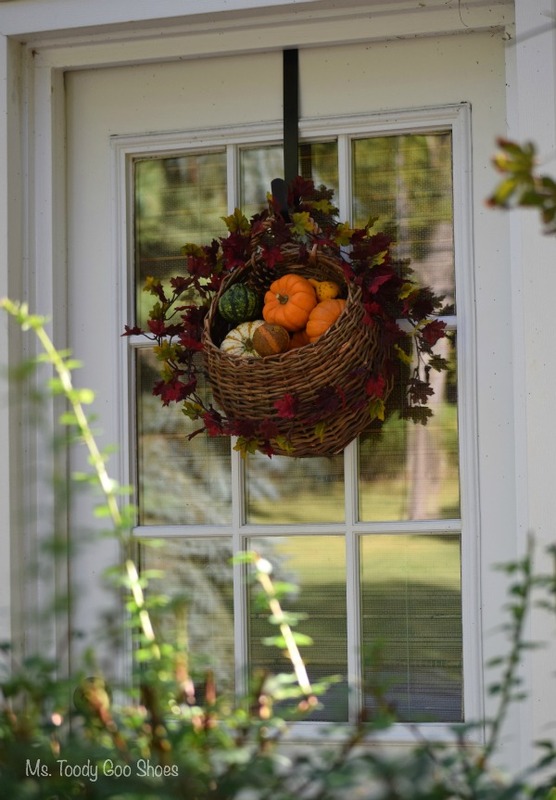 My pumpkins are starting to get soft and the mums, which are in perfect full bloom at the moment, will be fading soon. 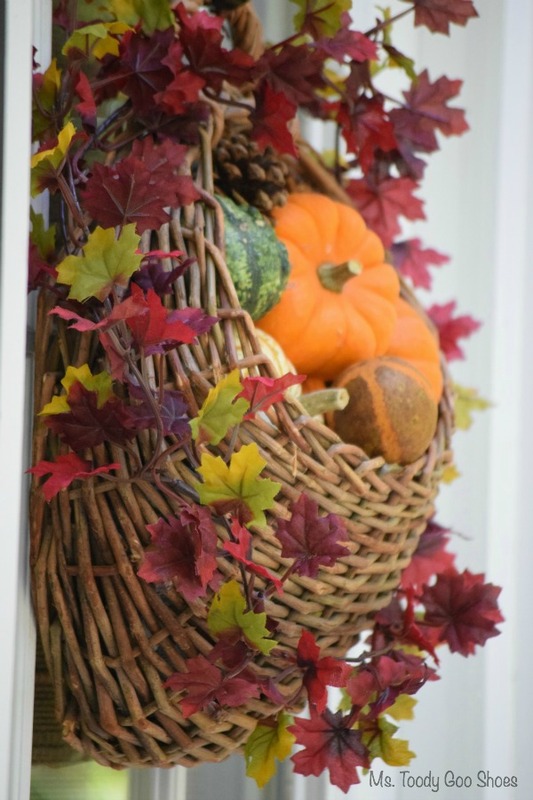 I like to keep my outdoor fall decor going through Thanksgiving weekend, if I can, before succumbing to the stark scenery of winter. 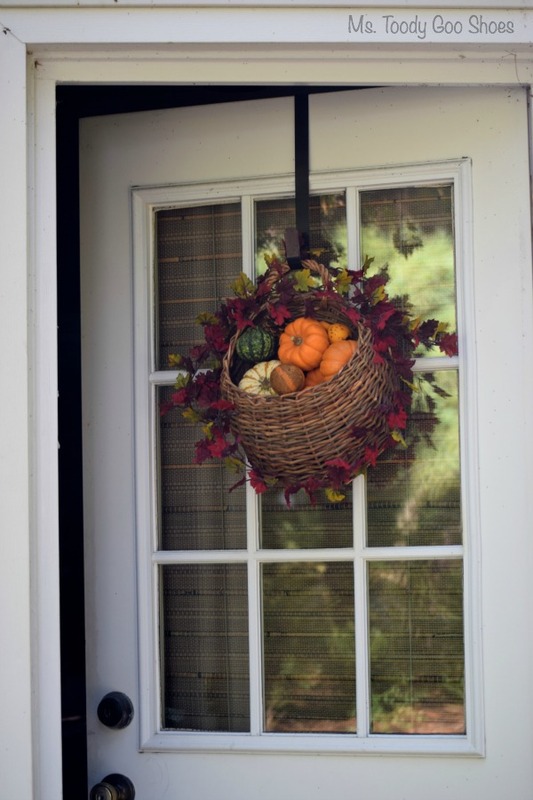 I made this easy, DIY hanging door basket for the door, so I can “hang on” to fall just a wee bit longer. This is so ridiculously easy, that I dare not call it a tutorial. You can pretty much look at it and see what to do. 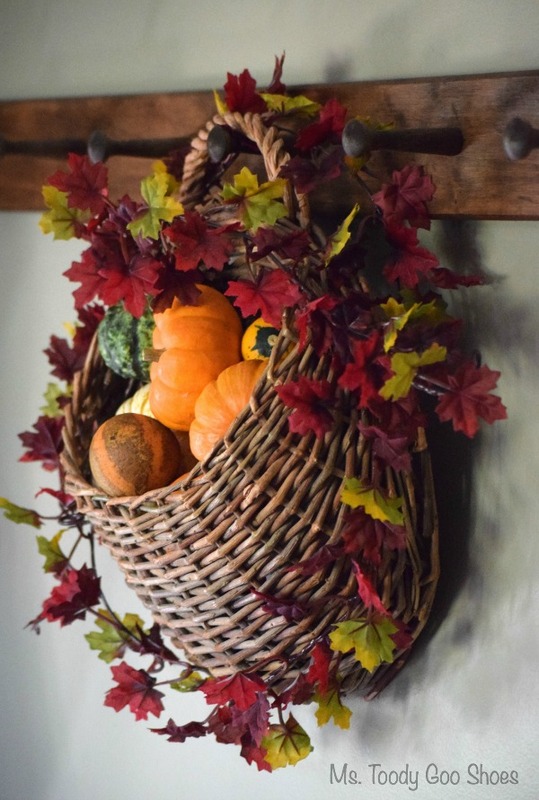 I used a hanging basket with a flat back, some gourds, mini pumpkins, pine cones, a leaf garland, and an over-the-door hook. And then…get your notepads out, because this is complicated stuff…I filled the basket, wrapped the garland around it, hung it up, and went to get my nails done. That’s my kind of DIY! 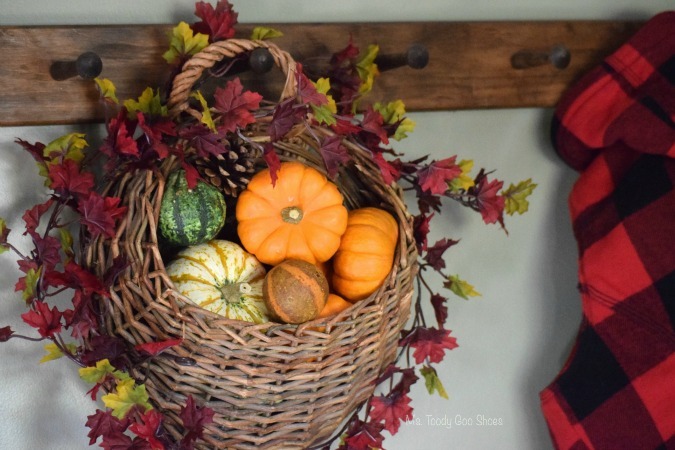 I hung my basket on the mud-room door, since this side of my house tends to get a little neglected when it comes to fall decorating. It’s a plain door that could use a little perking up. It’s a plain door that could use a little perking up. 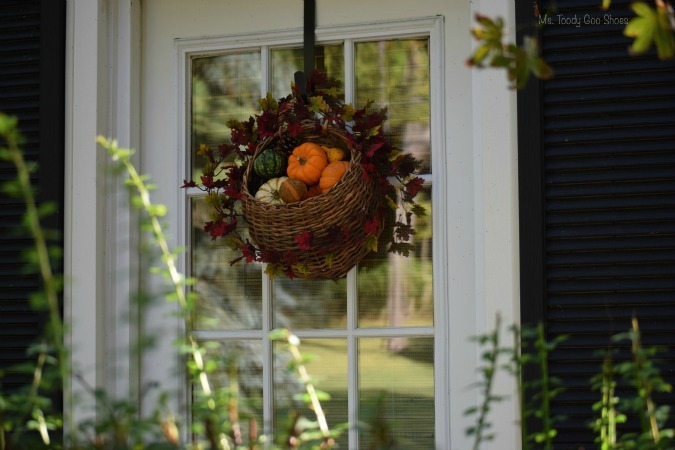 We actually use this door way more than the front door, so it’s nice to have something pretty to look at when we pull into the driveway. …but for now, I think I’ll use it as its intended purpose, outside. Wishing you and yours a Happy Thanksgiving! See you back here in December! 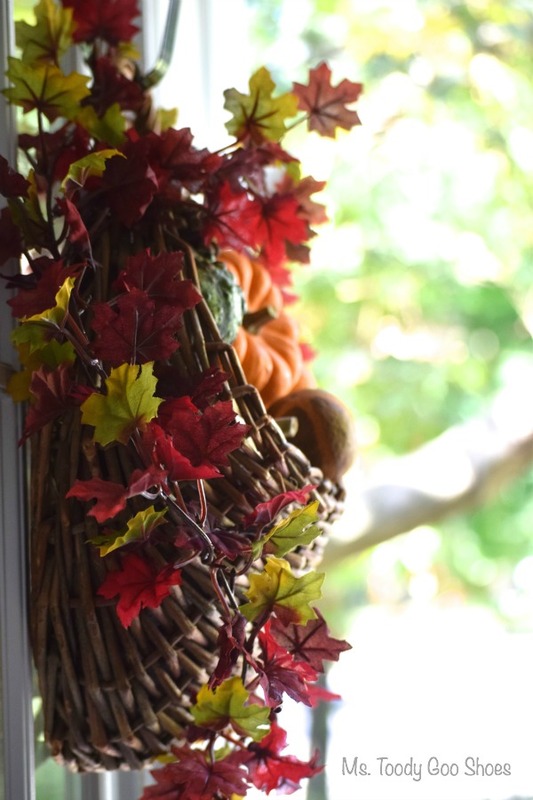 I’m with you Amy…definitely not ready to let go of Autumn or the pretty decor it brings. 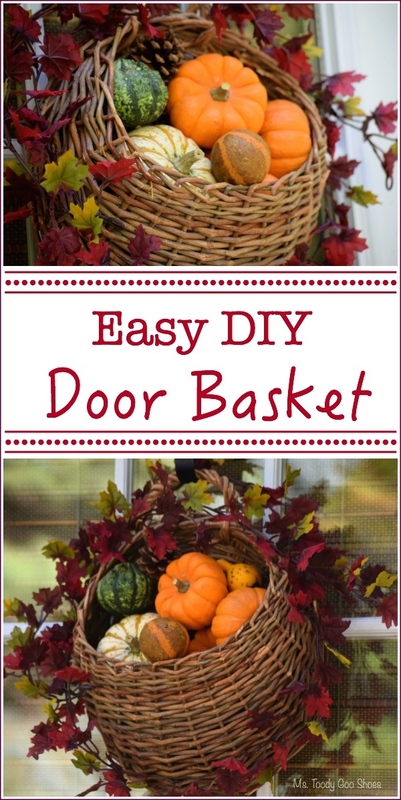 Your basket is adorable, and super easy too! Love your pictures as well. Very nice and perfect to keep that Fall feeling hanging on. I love it!! Amy you are so right time flies. It seems like every year October through December goes by in a blink and I have no idea why that is I love fall so much. Our mums are starting to fade some. I really love this, it may be simple but I like the garland around it. I try to find those kinds of baskets because they are one of my favorites. Do you believe every year I strike out? I know the crafts stores all have them but I never hit it right. Maybe next I will because I have been looking for a long-time. Enjoy your fall as long as you can. Great idea – and those colours are good together.